Please take a look at the invitation link below and save the date if you are interested in learning more about the plans for US281 currently being developed. This open house is scheduled to provide the general public with an opportunity to see the entire process involved in determining the Environmental Impact Statement (EIS) for expansion of US281 to meet traffic needs into the future. The last meeting of the Community Advisory Council (CAC) for the Environmental Impact Statement of US 281 Expansion project was held last night at Methodist Stone Oak Hospital to learn of the conclusions brought from 4+ years commitment to meeting regularly as community leaders and interested parties, with the various agencies that will ultimately be involved with the expansion of US 281. Our goal was to provide community feedback and input to the process of revising an Environmental Impact Statement to allow the expansion of US Hwy 281 to continue in some form after exploring how it would impact neighborhoods near existing 281 who use this highway for business and personal travel, businesses that were impacted by the potential suggested options being proposed, neighboring communities who would be impacted by the noise, traffic and improvement of the existing highway, and people living north of the anticipated project who use 281 as their means to travel to and from San Antonio and the surrounding area. PLEASE KEEP IN MIND THIS INFORMATION IS STILL PROPOSED AND NOT FINAL. The decision currently being proposed for approval is a combination of expressway lanes (or non-managed lanes) and toll lanes (or managed lanes). The project will begin at the connectors from 1604 to 281 and run north just past Borgfeld Road. The projected cost is $458 million and it will take approximately 4 years to complete. Funds have already been set aside for the project from a range of funding agencies. The toll portion once completed is projected to cost anywhere from .17 cents a mile to .50 cents a mile each way if you drive the toll portion of the road…that figure not determined at this date. The connectors coming from 1604 and being added to run into 281 coming from the east and west to head north have already been funded from a 30 million dollar fund that was provided to do the north south connectors coming from 281. There will be a VIA Park and Ride at the intersection of 281 and Stone Oak. VIA has purchased the SW corner of Stone Oak Parkway and 281 to build the facility and is using VIA money solely for that construction, the additional on/off ramps and lanes that will be necessary for the buses to navigate through the area. Questions about that project should be addressed to VIA. It should be noted that the (CAC) committee proposed three alternatives, no build, expressway and elevated expressway. There was no favor given to the toll option as a potential alternative by the CAC committee. However, the combination that has been given back to us appears to be a reasonable and combined solution that appears to meet the needs of the community and take that highway system into the future of its expected growth. Tolls or managed lanes would not be my first choice, as it seems we have paid for our highway systems with taxes already provided. Apparently, there isn’t a way to expand this highway system effectively and meet the environmental, community, growth and business needs without adding toll lanes to allow for some through traffic to quickly move to and from their destinations. We will be keeping 2 lanes on each side of the tolled lanes that allow for non-toll options to get to and from local stopping points throughout that project. They will be similar to what we currently have with stop lights, driveways and such along the way. There will be overpasses at the major intersections from Encino Rio, Evans, Stone Oak (which will ultimately be 3 level due to VIA’s needs), Wilderness Oak and Overlook Parkway will share one longer overpass, Bulverde Road and finally Borgfeld Road. Work at Borgfeld will be completed to ease the steep grade at that intersection as this project and the current Borgfeld expansion project come together. There was discussion about sound walls, bike trails, sidewalks and more as a part of the overall project. There are a great many details which are difficult to provide in a condensed and readable version at this time, especially since it is still a draft proposal and in process for finalization at this time. What is important is to let you all know that there will be a final public meeting for this proposal on May 8 from 5:30 p.m. to 7 p.m. at Summit Church, 2575 Marshall Road for the public to drop in and provide comment and view the project. Additionally comments can be submitted through the 411on281.com web site. If you want to see the project as proposed, ask questions and provide comment this is the place to do so. Comments will be taken until June for feedback to be provided. This is a huge project. It is huge money. It will take a long time and there will be construction delays and other difficulties while it is underway for anyone living north of the area and in the area of the construction proposed. I urge you to voice your opinions to the agencies in attendance at the open house as well as via web comment. This affects every property owner in Timberwood Park. Whether you like the idea proposed or hate it, please provide feedback and comment to the process! While spring-cleaning my home office recently, I went through old files and boxes of materials that have accumulated. It caused me to reflect on the journey our neighborhood took to accomplish self-rule and ownership of our assessment dollars. In keeping with the sense that it’s important to remember where we came from to get to our current day status, I decided to offer small a retrospective of the journey we undertook together. Like starting with approximately 100 paid members in 2006 when we began the journey in earnest as a neighborhood and growing to more than 1,500 paid members of a volunteer organization that functioned to provide property owners a voice to surrounding entities like the city and county, provide input toward some of the developer’s decisions and attempted to work together with the developer to bring property owner concerns and suggested improvements forward wherever possible. Like engaging a neighborhood that was divided with regard to Rule 11. Some property owners felt it should have happened many years before and didn’t. Some property owners felt that suing the developer was the only way to settle the matter. Some property owners felt it was impossible to even consider there was a problem between developer and property owners. And finally, there were those property owners, like myself who didn’t even know Rule 11 existed when we bought in Timberwood Park. Like running a volunteer organization with $25,000 annual budget provided by the voluntary dues paid by property owners in the neighborhood. An organization which provided essential interface with city and county officials, elected officials, and our developer to assist in the business of the neighborhood. And while it did that it also provided social activities meant to bring the neighborhood together like Music In the Park, an original annual outdoor music concert series developed to bring the entire neighborhood together for an evening under the stars listening to good music from local bands in our area. This whether you were a member of the association or not! Like meeting, learning about and getting to know so many of the property owners of Timberwood Park, seeing the generosity of so many of the property owners, the volunteers who came out to support community activities without expecting any reward other than a thanks and so much more! Some of the more interesting moments as we worked toward reaching turnover which still confound me to this day include receiving a Sunday morning phone call to my home when we were in the final stages of negotiating the turnover from one property owner who called to suggest that if I would consider supporting a back gate into the park that person would consider providing more substantial financial support for the legal fund. And on another couple of instances I received anonymous negative letters in my mailbox. It was an interesting time to say the least. While I never entertained that potential “gate deal” and the letters..they were what they were. I am grateful for the monumental support of those property owners who felt TPPOA was doing the job right and wanted to see us through to the finish line. The countless support of all those property owners made it possible to stick with it even when it sometimes seemed like we might never reach the finish line. It’s been said to me repeatedly over the last couple of years by some property owners that they felt that while the board and I did all the work to get us to this time in our history when we can call our own shots and do our own thing, we/I were never thanked for all the work put into making the turnover a reality. I disagree. I received such overwhelming support for the job done while on the board by so many property owners that I never felt I wasn’t appreciated for the job I had done. And for those few times when someone didn’t feel that way, well that’s the nature and the politics of making a deal that everyone could live with. Not everyone will agree and not everyone will be happy but if you can look back and know you did your best and provided what the majority felt was the right choice, then bravo! Another positive milestone which reflected the success of the entire journey…at the end of the process, when we had reached a settlement, we were able to refund the monies provided for the legal fund back to the property owners who trusted us enough to participate in the journey to the finish line because we didn’t have to use it! Success! Once turnover had been reached, it was interesting to see the property owners who had not been previously involved in the monthly meetings or the turnover process in general, step up to run for office to take over the reins for our newfound freedom. While I knew I had done the job I had set out to do, and was more than content to call it a day, I had been counseled about the “run for office” phenomenon during the negotiation process and to expect many candidates interested in running when none could be found previously, so it was no surprise when it actually occurred, but nonetheless it was interesting to watch unfold. It’s fascinating to me that 3 years into the turnover, and long after my participation in the process, I still meet people at HEB, at the gas station, at the local home improvement store, at restaurants who walk up to me and introduce themselves and talk about Timberwood and the turnover. Most are very kind and have pleasant words of encouragement and thanks for the job of getting us successfully into an agreement to reach turnover. One recent conversation however at HEB was particularly memorable for me. The property owner speaking to me called me, in a laughing manner, a b***h, but then stated they understood that it was necessary to be that way in order to facilitate turnover. We actually had a good conversation in spite of the initial comment. I still laugh about that one! I have even heard very recently how much I am still disliked by some swim team members. Curious, since it was TPPOA that saved the swim team from being disbanded by the developer because of numerous complaints by paying pool members for various reasons. Maybe it was because in order to achieve some balance for the good of the entire neighborhood and be able to keep the team for participating neighborhood children it was necessary to negotiate with the developer to bring the same standards of use applied to all other property owners to the swim team. After learning that the major complaints by paying pool members were: 1) that the swim team participants didn’t pay pool fees for their extended use of the pool, 2) that some, but not all, of the property owners who participated in the swim team were not current on their assessment fees but still allowed pool access, and 3) that the swim team at times ran over the paying pool members without regard to their right to use the pool as well, it was necessary to craft an agreement that provided for the participants to be current on their assessment fees, pay a pool fee and provide some rules that allowed other paying pool members to be able to enjoy the pool as well. The turnover and end of Rule 11 was accomplished by a great group of property owner volunteers who participated in a voluntary journey. Among them and in the middle of it all, the board members who worked together as a team for many long hours, and, who over a period of almost 5 years spent countless volunteer hours working on a massive amount of detailed facts and information about our development which ultimately allowed us to come to the table prepared to negotiate and able to make a successful deal without incurring an expensive legal battle. Thanks to the generosity of more than ½ the neighborhood voluntarily contributing to the legal fund, we had the ability to navigate more effectively when it came time to negotiate a turnover agreement. And so I write this piece to put to rest some of the rumors and misconceptions about what continues to be circulated about the previous administration and the job it did or didn’t do. I’ve heard the line “the previous administration didn’t do anything” thrown out several times at several meetings since turnover occurred. Nothing is farther from the truth. It’s from that “nothing done” the neighborhood came into self rule and ownership of the assessment dollars to manage that rule. Here’s my take on that. We had a developer who did what developers do…develop the neighborhood. It took more than 30 years to reach a percentage of completion on our roadways and the development lot sales to come to a point where turnover could be facilitated. The developer’s interests may not have coincided directly with the property owners at all times, but nonetheless they should be given their due and credit for creating why most of us moved to Timberwood: a country-like atmosphere with large lots, trees in abundance, wildlife still roaming freely, upscale custom homes built with distinction and providing amenities like a 30 acre park for the property owners that makes our development unique. More importantly, with pros for having them and cons for what they don’t provide, less restrictive covenants that allow each of us to enjoy our property without worrying that an overbearing association might pursue undue regulation on our personal lives. That’s saying something these days when you look around at developments all around us. For the TPPOA’s part in all this, well, a small but determined group of volunteer board members managed to build an organization from the ground up that the developer could take seriously as being interested in running their own affairs. 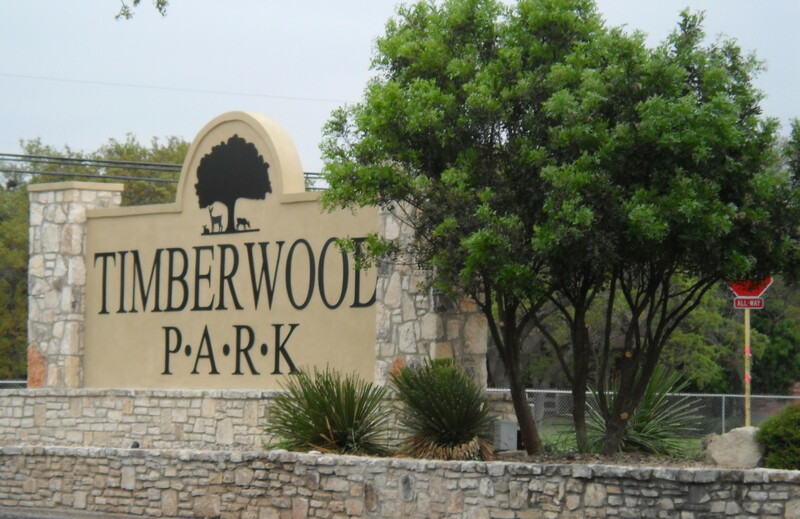 From its small start to its growth into the inclusion of a large percentage of the property owners interested in pursuing the end result voluntarily, with a budget of $25-$30,000 a year, we accomplished much on behalf of the property owners of Timberwood Park. That previous administration that “did nothing” did everything. Remembering where we came from is essential for the future of the development. We should not want to lose what makes Timberwood unique. We should stand up for it and embrace it and remind ourselves that while “the previous administration did nothing” it was that nothing that brought us to this place of having $600,000 a year to spend on the things that matter to the property owners in terms of improvements, amenities and maintaining our neighborhood. Good stewardship and reasonable use of property owner assessment dollars is essential to keeping operating costs and associated expenses in check. Projects are all well and good and moving forward is a sign of progress. But not accounting to the property owners about leaks in the kiddie swimming addition which will potentially cause a major overhaul of a project which already cost the property owners in excess of $50,000; broken major electrical lines in the park during construction of basketball courts and additional tennis courts not budgeted into the original cost of the project, and overruns on bids that were given for various projects make expenditures made thus far expand beyond what property owners believed they were paying for these improvements. The board should be providing accountability to the property owner for these discrepancies and better yet keeping them informed as the property owners who are paying for these expenditures. The neighborhood currently enjoys property tax exempt or nominal tax status originally facilitated under the old TPPOA organization with Bexar County. This status keeps our property taxes low for the 30 acre park with its improvements. More and more improvements will raise our visibility when a reassessment is done, just like a new clubhouse in excess of a $1 Million dollars will raise the value of the property, and we will probably lose that $1000 a year tax fee we currently enjoy in addition to paying much higher taxes for the property and improvements down the road. Overhead costs will continue to rise as improvements require additional expense to operate. Allowing property owners to benefit from charging for tennis lessons, or for that matter any business related opportunity for which they are earning income in a park paid for by the entire property ownership of Timberwood Park for the free use of the property owners, and for which they have no overhead to run their business from, and which then impacts the other property owner’s use of those same tennis courts or other parts of the park seems like an uneven playing field when dealing with best interest of all property owners. Maybe consideration should be given to giving back to the property owners in the form of a reduction of the assessment fees. After all, we have a substantial amount of money available to use each year now, maybe one of the benefits could be lowering the annual fee. Do we really need to keep improving? And that’s where I will leave this if you are still reading. Thanks for subscribing to the blog, and for being an interested property owner. In the future, the blogs will be of meetings I have attended or events in our community that you might be interested in learning about. I am headed to a meeting this evening covering US 281 and what’s happening there. I’ll be reporting back to you once I have the info available. The entries to the blog will be probably be less often as I have moved on to other interests which take up some of my time. Be involved in your neighborhood. Share this and any other posts you found helpful or useful with any other property owner you believe might like to read it…especially anyone who is thinking of running for office. I give credit to anyone who is willing to run for office, especially an HOA office. It can be a rewarding job, but it can also be difficult and has detractors. Like having someone like me call it like I see it from the sidelines!